Oh haha...I hope I made you feel young! I hope you enjoy watching them. My plan is to be in Montreal in 2020. I'm afraid I'll have to wait until then to see anything live. I wanted to go to NB for Canadians but I don't think I'll be able to swing it and do Montreal as well. Thanks Elizabeth for the info. U.S. Olympic Team member Karen Chen has withdrawn from the ladies event, while Tarah Kayne and Danny O’Shea have withdrawn from the pairs event. Second alternate Mariah Bell will replace Chen in the ladies competition. Ashley Wagner, the first alternate, declined an invitation to the event. Bell finished fifth at the 2018 U.S. Championships. In the 2016-17 season, Bell won the silver medal at Skate America and won bronze at the U.S. Championships. She finished 12th at the World Championships last season. Deanna Stellato and Nathan Bartholomay will replace Kayne and O’Shea in the pairs competition. Stellato and Bartholomay have been U.S. medalists in each of their two seasons, earning pewter in 2017 and bronze in 2018. Danielle Earl's last time conversion of the season is below - I believe the one for Sunday, March 25th may be out by an hour as Milan goes to Daylight Saving Time overnight March 24-25, putting them back into 6 hours ahead of EDT rather than 5 as they are now. Practices are underway in Milan although not everyone has yet arrived - Jackie Wong is tweeting some practice notes that should appear on his www.rockerskating.com website. 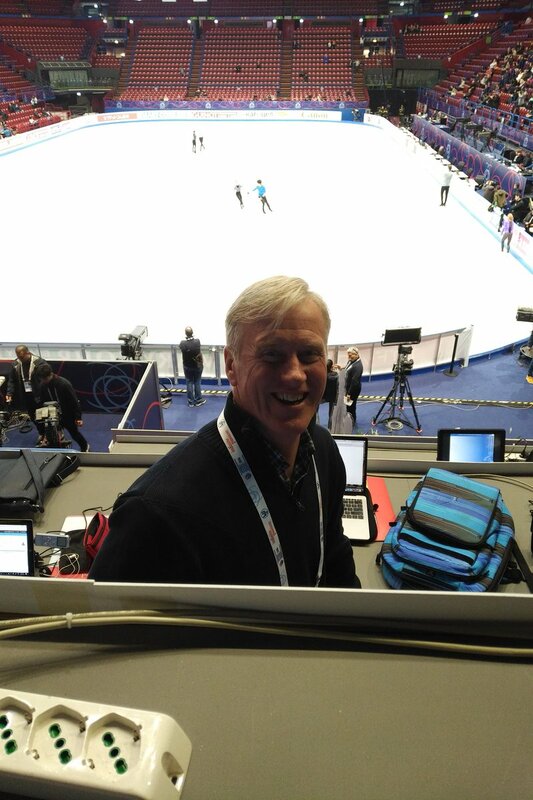 Competition begins on Wednesday and CBC TV coverage begins on Wednesday evening at 7 p.m. local time. When I think of Milan, I think of the Duomo (and remember walking on its root many years ago). Obviously, those presenting the Worlds have a similar image in mind with their very original "kiss 'n cry"! hoping for some divine intervention perhaps? Pleased to see some high ranking Olympians chose to participate, so some other hopefuls may have to wait another year before stepping onto the podium - a very interesting last event of this this exciting season. 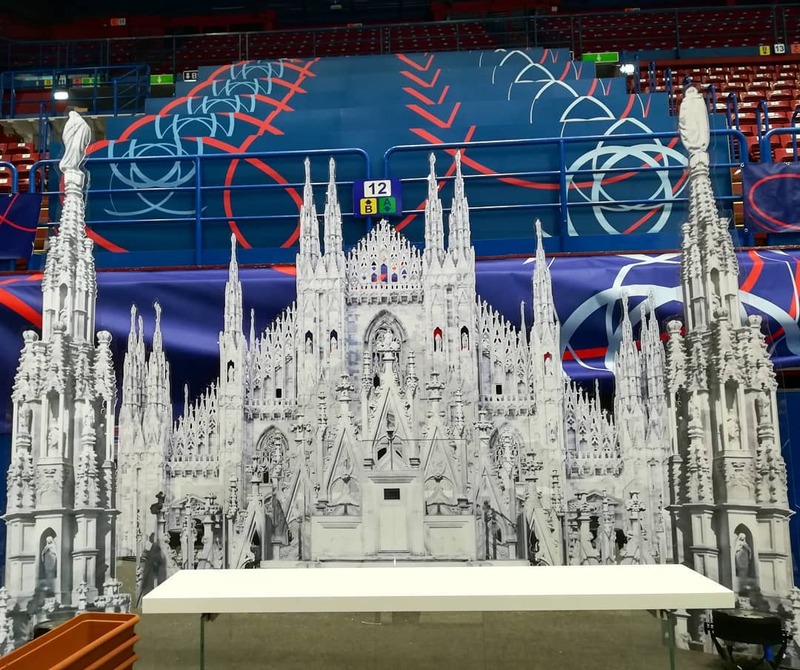 CBC will be represented in Milan by PJ Kwong and Paul Martini - they were in the stands watching practices today. GREAT!! That's very good news for fans! Thanks for all the info. Don't be misled - PJ and Paul will be there to do interviews, write articles, etc. The regular CBC host and play-by-play commentators will be in the studio in Toronto, as during the GP season, as far as I know. Last edited by Elizabeth on Tue Mar 20, 2018 10:11 am, edited 2 times in total. Larkyn Austman will be in Group 2 while Gabby Daleman and Kaetlyn Osmond will be in Groups 6 & 7 respectively. Only 24 ladies will go forward to the free skate. I see that both of the couples who were missing equipment are listed - I hope that means that they will actually be able to compete. 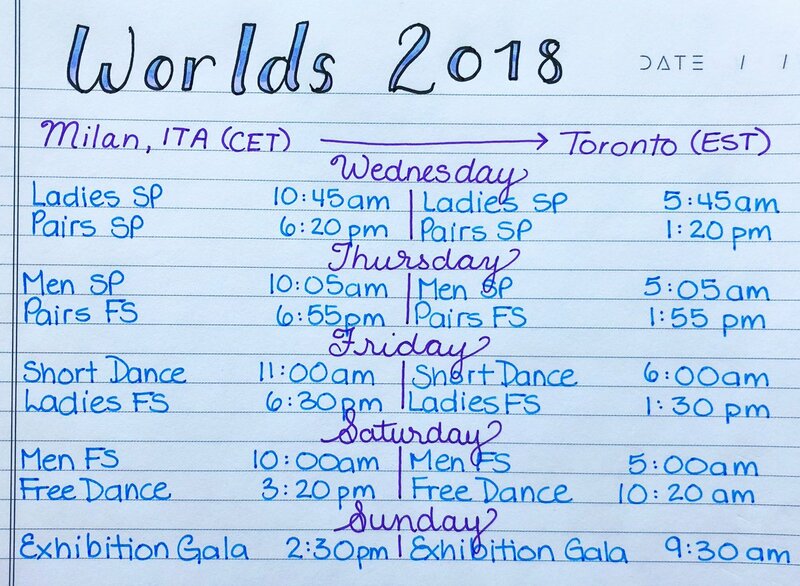 Yes, those are the start times for the short programs of Larkyn, Gabby & Kaetlyn for those of us in EDT. Milan is 5 hours ahead of us through Saturday and will be back to the "normal" 6 hours ahead as of Sunday. The CBC live stream http://www.cbc.ca/1.4581681 had a brief "hiccup" as the replay of Larkyn's skate was going on and we missed part of the next skater's program before they got it back on line. The first resurfacing is happening now. I've seen many familiar faces in the crowd, which is fairly sparse in the early going. The conversation ranged from the Olympics to Worlds, etc. Let’s all give a round of applause to @edeaskates and @JacksonUltima for giving @DrewWolfe_ brand new skates and blades YESTERDAY so he could compete today at #WorldFigure after @lufthansa lost his bags and hasn’t found them yet! Add @DrewWolfe_ wearing brand new skates and a new type of blade he’s never worn until yesterday to that bundle of things to watch for! Drew is an incredible athlete to be able to pull that off!!! I was impressed. I'm glad the Canadians won't be too early tomorrow. I've caught the sore throat & ears bug and so I'm laying low, not too low for skating though! I'll say watch out for Nathan Chen...he'll be out for redemption. There was fear on Tuesday that Shoma Uno would be withdrawing from the competition - he apparently started using new boots after the Olympics and they have been bothering his foot. He only practiced for a few minutes on Tuesday and then went to a hospital for x-rays as there was a suspicion of something more than the boot issue. Thankfully, that turned out not to be true and he has apparently insisted on competing.